Peterhead manager Jim McInally says that winger Jamie Stevenson made the difference in Saturday’s 1-0 win at home to Berwick Rangers. The winning goal came from some excellent build up play by Stevenson who provided the assist for Rory Mcallister to secure the win. “The difference in the second half was Jamie Stevenson,” said McInally. “He gets into the box and clips in some nice balls and we scored a few from that last season. The win keeps The Blue Toon hot on the heels of league leaders Edinburgh City as the first quarter of the season come closer to an end. “It was a good result but a bang average performance,” said McInally. “A short pass in midfield and they break away and it was a terrific save by our keeper. “We had so much possession in the first half but for all the intricate passing moves we never tested their keeper. 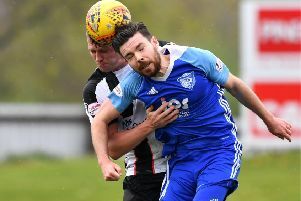 Next up for Peterhead will be a trip to the Borders and a tricky match against Annan Athletic who are coming off the back of an impressive 2-1 win away to Stirling Albion on Saturday. “We are playing an Annan side on Saturday that won well at Stirling.